When I brought the buck onto the property in October, the two doelings born in July were still small enough to get in and out of the various goat pens. I had seen Chai in the buck pen but had never seen Thyme in with the buck. I have been keeping an eye on Chai – hoping that she had not gotten bred. However, a couple of weeks ago I noticed that Thyme had developed a “bag” so figured she had indeed spent some time with the buck. My other does generally bag up pretty early in pregnancy so I was figuring Thyme was probably about three months into a pregnancy (gestation for goats and sheep is 150 days plus or minus) and would probably kid out in late May/early June. 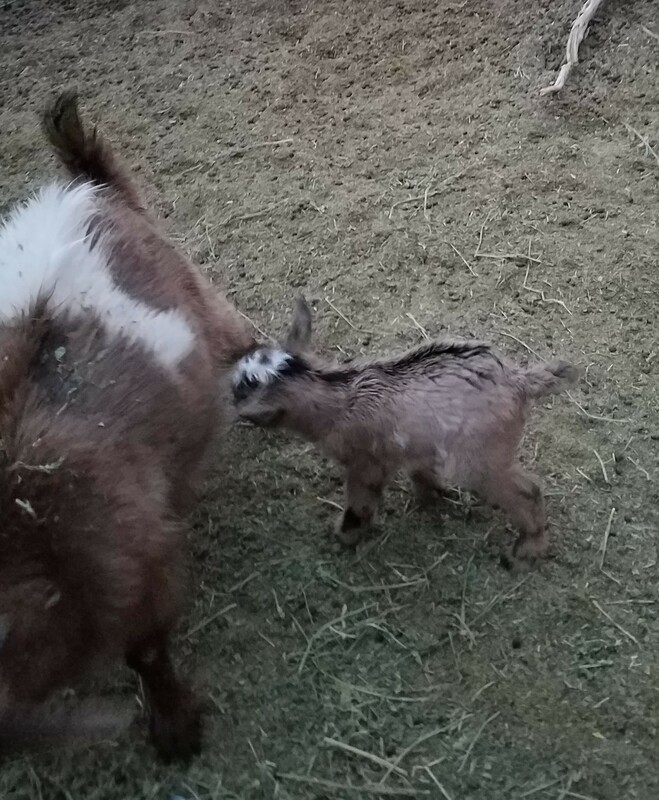 So when I got home late this evening and was rushing to feed and water before dark it took me a little bit to realize there was a new goat in the goat pen. I hurriedly made some adjustments in the lambing jugs and set up a jug for the new mom and her buckling. I haven’t weighed him yet but am guessing he is about three pounds. More photos and details tomorrow. EEEEEEEEEE, success! wish it were a doeling, but, ….. at least milk in the near future! YAY!